'Abdu'l-Bahá's Journey in the West . . .: June 3, 1912 Empires will crumble . . .
"Later on that day, upon having been invited, 'Abdu'l- Bahá traveled to the estate of an unidentified U.S. Cabinet member, where He spent the night. A social gathering was held, attended by notables and national statesmen, who were respectfully attentive to the Master's utterances. One gentleman inquired about the possibility of international war. 'Abdu'l-Bahá spoke of this event as likely: "Great ravages will take place in Europe. Great empires will crumble and will become petty states." "The following day [June 4], before leaving the estate, the Master called the servants, and thanking them distributed a gift of money to each one of them. Back home, He found the many friends waiting for Him and spoke at length to them." 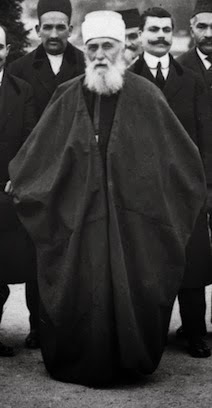 Mahmúd specifies that "Mr Penshoe [Gifford Pinchot, AP], a cabinet member of the United States government, invited `Abdu'l-Bahá to Milford [his estate outside the city, in Pennsylvania, called Grey Gardens]. For a day and a night many prominent statesmen and dignitaries of the Republic were enraptured, fascinated by the Master. His address to one of the meetings has been recorded separately. [SOW, vol. 7, no. 9, pp. 77–84] A compendium of the addresses and His answers made during that time would be in itself a complete book. NOTE: This Sunday there is a commemoration at the Milford estate. Laura Lawrence writes: The FIRST PART is a picnic and formal program on the shores of the Delaware River in the Delaware Water Gap National Recreation Area - Milford Beach from 10:00 AM to1:00 PM. RAIN OR SHINE! 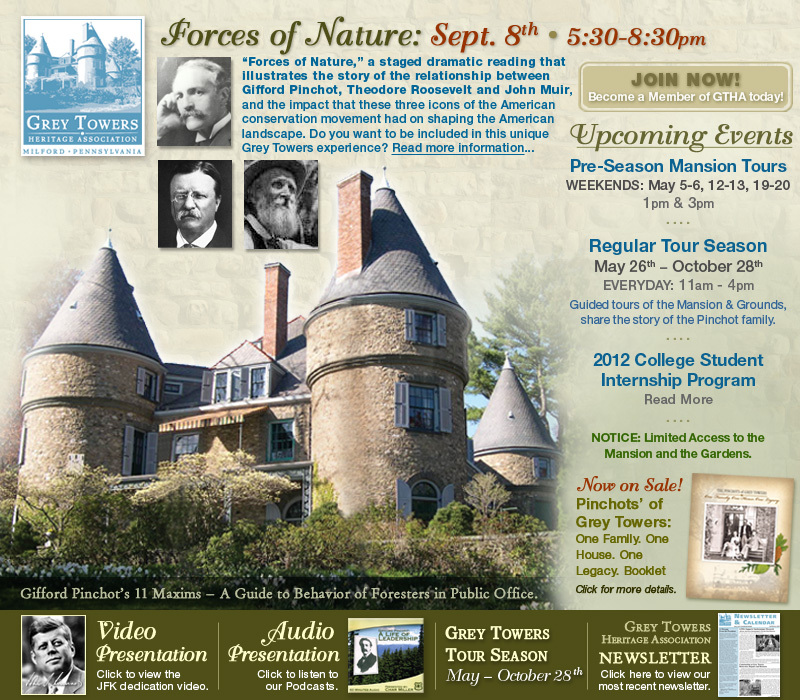 The SECOND PART is at the mansion of Grey Towers in Milford PA (distance of about 1 1/2 miles between each other) from 2 - 4 PM. Contact lglawrence19@yahoo.com for details. Juliet's version of seeing the actor with Abdu'l-Baha is even more rich in details: "On Monday [June 3] again I went to the Master at seven-thirty. As I got off the bus at Seventy-Eighth Street and Riverside Drive I saw Him at the centre of a little group standing beside that strip of park that drops low to the river--the part we love to call "His garden," a forever hallowed spot to us, for there we sometimes walk with Him in the evenings, there He takes His daily exercise, or escapes from the house to rest and pray. The people who were with Him this morning were Nancy Sholl and Ruth Berkeley, Mr MacNutt and Mr Mills, and, as I hurried to join them, I saw that the Master was anointing them from a vial of attar of rose. Oh the heavenly perfume, the pale, early-morning sunshine and the Master, all in white glistening in it (no one else takes the sunlight as He does: He is like a polished mirror to the sun), the ecstatic, intoxicating love with which He rubbed our foreheads with His strong fingers dripping with that essence of a hundred roses! Soon we saw Miss Buckton crossing the street toward us, bringing with her a tall young man with a remarkable face, very pure and serene, which seemed somehow familiar to me. The Master abruptly left us and met the two in the middle of the Drive. Then I saw Him open His arms wide and clasp the young man to His breast. We all followed the Master to His house, where the young man was introduced to me, and then I knew why his face had seemed familiar. He was Walter Hempden. I had seen him in the theatre. I was in the audience, he on the stage playing the part of "the Servant" in The Servant in the House: Christ. And he played it so intensely, with such spiritual fervour, that I prayed with all my heart, there in the audience, that he might some day meet the real "Servant!" So--Juliet's prayer was answered. It's interesting to read about the actor who was entranced by the Master and came everyday to see Him. I wish we had his recollections! Walter Hampden was one of the great American stage actors and the only performer aside from Maurice Evans to play Hamlet three times on Broadway in the post-World War I-era. Born Walter Hampden Dougherty on June 30, 1879 in Brooklyn, New York, he learned his craft in London, where he made his debut as a professional actor in 1901 with the Frank Benson Stock Company. He spent six years apprenticing in England, where he was thoroughly trained as a classical actor. When he returned to the US In 1907, he toured with the great Russian actress Nazimova in a presentation of the plays of Henrik Ibsen. Hampden played "Hamlet" on Broadway in 1918-1919, in 1925 (with Ethel Barrymore as his Ophelia at his own Hampden's Theatre), and in 1934. His greatest role was that of Edmond Rostand's "Cyrano de Bergerac," a part he first performed in 1923 and that he repeated four more times on the Great White Way. In 1925, he took over management of the Colonial Theatre, a vaudeville house in Upper Broadway, and renamed it Hampden's Theatre. After christening his house with his second Hamlet on October 10, 1925, he played there with his own company through 1930. Later, Hampden helped launch the American Repertory Theatre, playing Cardinal Wolsey in Shakespeare's "Henry VIII." Hampden became revered as the grand old man of the American theater. He was president of the Players' Club for 27 years. His last distinguished role on Broadway was in Arthur Millers parable of McCarthyism, "The Crucible," capping a career that spanned a half-century.